We’ve brought you the off road camper trailer, an expanding trailer, a vintage camper and an electric trailer but today we’re going to be looking at the latest travel trailer for any outdoorsy person: the Base Camp Trailer is the perfect tiny home for any weekend warrior who wants a tiny trailer to be able to enjoy as their adventure base camp. Compact, stylish and the ideal companion for any outdoor adventure the base camp could be the tiny house you need to help you live life to the fullest. 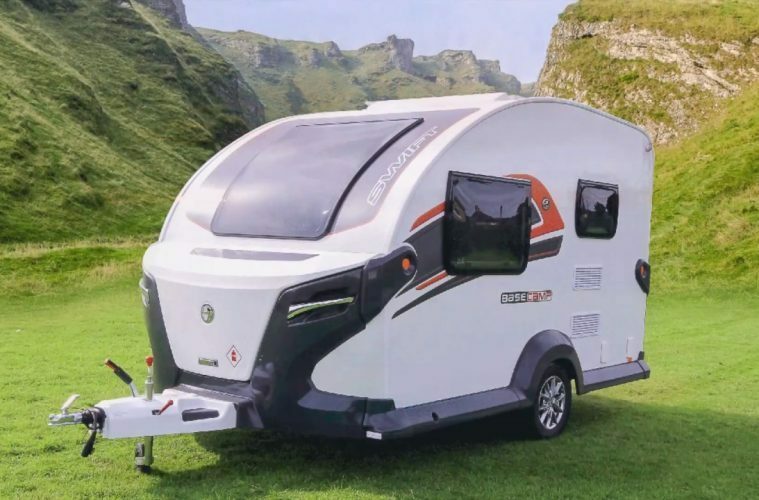 The base camp trailer, which is brought to you by one of the largest caravan manufacturers in the UK, Swift, is modest in size. Measuring just 5.10m long, 2.28m wide and 5.58m from the exterior, this compact trailer can be easily towed by smaller vehicles and is more fuel efficient compared to its larger counterparts. Its aerodynamic shape also contributes to a more efficient fuel consumption and safer towing. Small travel trailers don’t have to mean a compromise in the interior living space, as we showed you in this pop up trailer and Swift’s Base Camp trailer certainly doesn’t make any compromises. The Base camp trailer is a luxury trailer to come home to after a long, tiring day of adventuring. One of the more luxurious features of the base camp trailer is its mobile electronic system. 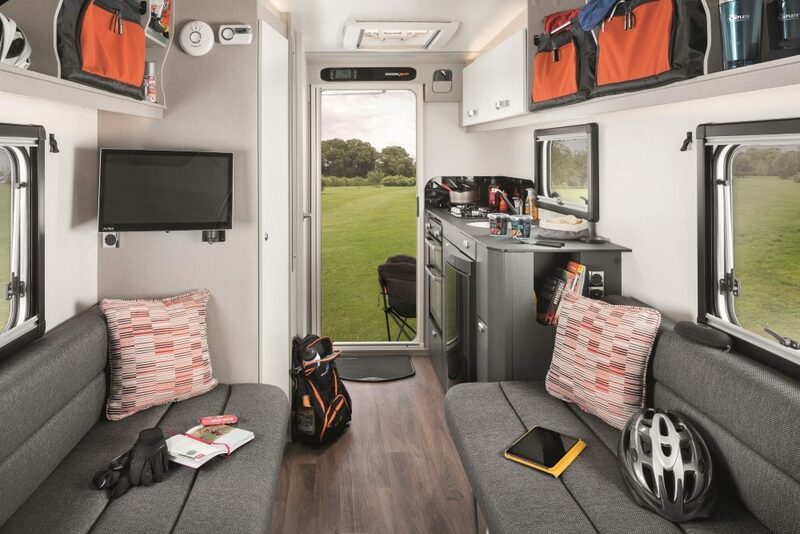 By downloading the Swift Command app to your smartphone, you can control certain electrical aspects within the base camp trailer with a tap of your thumb. Pretty magical, although not as magical as this tiny Harry Potter House! By using swifts app, you can track your power usage and manage your batteries to ensure efficient utilisation, control the trailer’s lighting, turn the heating on and off and adjust its settings and Jeep an eye on your water levels. On top of all of this the base camp trailer is fitted with a location tracker so, using the app, you can view where your base camp trailer is at all times. Best of all, certain features within the base camp trailer can be controlled remotely. This means you can turn your heating on so that by the time you get back it will be nice and toasty- perfect for UK van life! 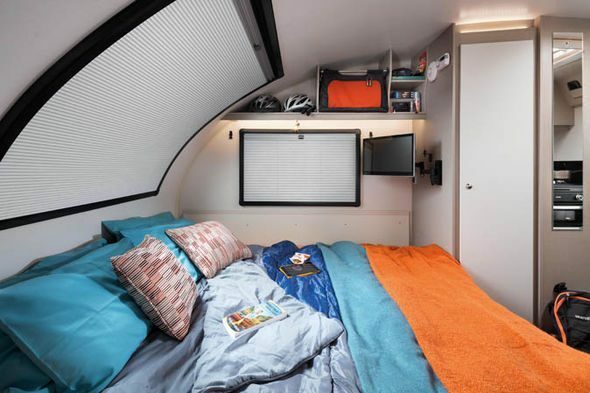 The electrics can either run of off a mains hook up, or you can upgrade the Base Camp trailer to include a roof-mounted solar panel, turning this camper into the perfect off grid caravan. The added solar panel means you can venture into the wilderness for long periods without needing to charge your battery, perfect for any off grid adventure. The swift command app isn’t the only modern and innovative solution to be found within the Base Camp trailer. Just like all of Swift’s touring caravans the Base Camp Trailer is built using their ‘SMART’ intelligent construction system. Included within this is a strong timberless body’s that is highly resilient to moisture, the use of modern materials to give the Base Camp trailer a desirable and stylish finish and a brilliant insulation system to ensure warmth and comfort, even in the coldest months. All of these features mean that the Base Camp trailer really is a vehicle for all four seasons and can withstand temperatures below freezing, while still keeping you nice and warm. Snowy camping sessions her you come! After a long day of hiking, mountain biking or climbing all you want to do when you get in is sit down and relax. With the Base Camp trailer, this couldn’t be easier. No more scrambling for the best camping chair and lighting a fire, with the heating already on Base Camp trailer will be nice and warm for you to lounge on the comfortable seating. Two large windows behind each bench seat and a large, curved panoramic window stretching above the seats allows in plenty of light and means you to bring a little of the outdoors back inside with you. Between the two comfortable bench seats you can put up the collapsible table, making a dining table or plate of space for a relaxing games night after your day outside. The table is a generous size so there will be no jostling for space once the dinner plates are out and can be easily folded down and stored beside the wardrobe when not in use. Tiny homes need to have plenty of duel purpose furniture so, when it’s time for bed, the generously sized bench seats can transform either into two single beds or into one large double bed. The enormous double bed fills the entire front section of the Base Camp- making for a relaxing trailer life. Right above your head is the large panoramic window, a perfect spot for some stargazing while staying warm and cosy. Or, if you want some privacy, pull time the blind and fly net and stick a film on. A 15” fold away TV bracket can be added to your Base Camp trailer as an added extra and is the perfect addition for those who plan on spending a lot of time in their all terrain camper. While adventuring is the best way to spend a day, it certainly takes a lot of energy. 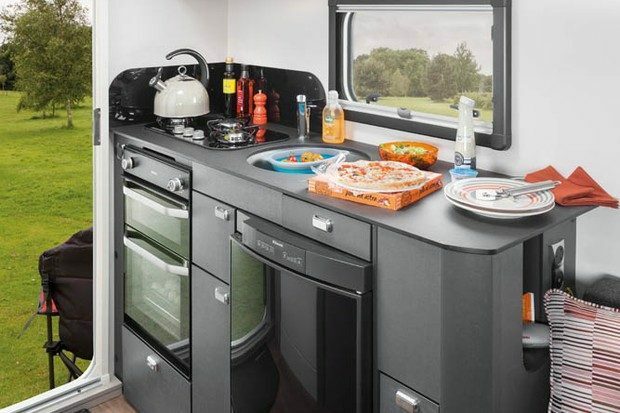 A good, hearty breakfast is needed before you head out and the Base Camp trailer couldn’t be better equipped to help you rustle up a good fry up. The kitchen area takes up one wall in the front section of the trailer, meaning you have plenty of space for cooking, as well as lots of headroom with a ceiling of 6’5”, even with the overhead wall mounted storage cupboards about the countertop. The skylight above and window in front of the work surface allows for plenty of natural light to make the Base Camp kitchen feel spacious and if it’s a nice day the door on the rear wall could be opened to allow more light and some fresh air in. The kitchen itself comprises of a three-ring hob and grill, meaning you have plenty of space to cook a variety of meals. You can also upgrade your base camp trailer and add an oven to your trailer, perfect for quick and easy meals after a busy day outside. Below the countertop is a generous 85l Dometic fridge/freezer, ideal for longer adventures and off grid living. The sink in the kitchen area has a rapid hot water supply thank to the Base Camp water heater. Washing up couldn’t be easier. The rapid hot water also stretches into the bathroom of the Base Camp trailer which includes a toilet, sink, mirror, storage areas, shower and skylight. The shower comes with an Ecocamel Orbit shower head, providing a powerful yet water saving shower, meaning your onboard water will last longer. The Thetford toilet comes with an electric flush, adding a little bit of luxury to your bathroom experience. Beside the compact but functional bathroom stands a large wardrobe, ideal for neatly storing all of the clothing needed for your adventure. What really makes the Base Camp ready for an adventure at any time are a few unique features that are simple but effective. First, are the removable storage baskets that are kept overhead above the seating/sleeping area. These are convenient to pack as they can be removed and taken into your house or apartment and kept full packed ready for a quick getaway. They can also be thrown into your backpack for the day, no need to unpack your gear just to repack it into a different bag. Secondly, the anchor points on the floor in the living space means you can safely secure your outdoor equipment to the floor for easy transit. Your gear, mountain bikes, for example, can be attached to these points using bungee ties or cables and mean you don’t need to bother with an exterior mounted bike rack. The seats in the living area fold back into the wall of the Base Camp to reveal these anchor points. This means you have loads of floor space to chuck all of your gear into, making for a quicker and easier start to your adventure. The floor is made of a robust and easy to clean oak effect lino, meaning there is no need to wash your gear before storing it for transit. However, if you did want to spray down your bikes after a muddy ride, an outdoor shower head can be added to your Base Camp. 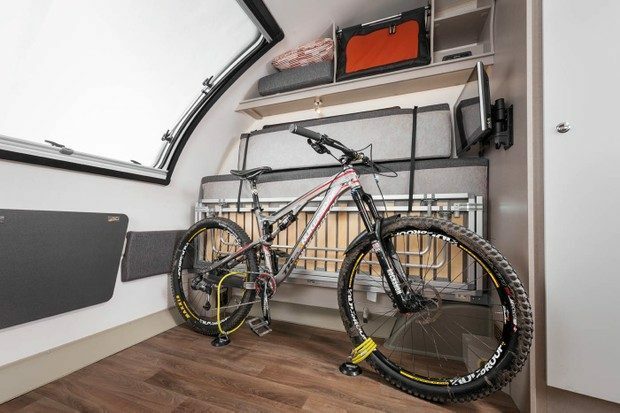 We’re a fan of Swift’s Base Camp and do think it would be the perfect partner to help you get outside and adventuring. It’s easy to tow, practical and comfortable and contains everything you need for a relaxing break in the wilderness. The interior layout and design are well thought out to give you enough space for gear without compromising on aesthetics or comfort, and we love the ability to be able to control the heating using the Swift Command app. The Base Camp sits in the middle price wise, with the basic package costing £16,910- not outrageous for what the Base Camp has to offer. All in all, we think this is a great camper van and would be ideal for any adventurous couple. Take a peek at these incredible campervan gifts. This bicycle camper proves that you can get off the grid for less. Explore the sea with the Titan Underwater Drone!